More models, please feel free to contact us for mode detals. Clip this hands free earpiece onto your shirt and begin using your motorola radio device to communicate discretely and easily, whether you're in security, retail, or hospitality. In-line microphone and push-to-talk button. The earbud fits snugly in the ear with easy and keeps your conversations private. 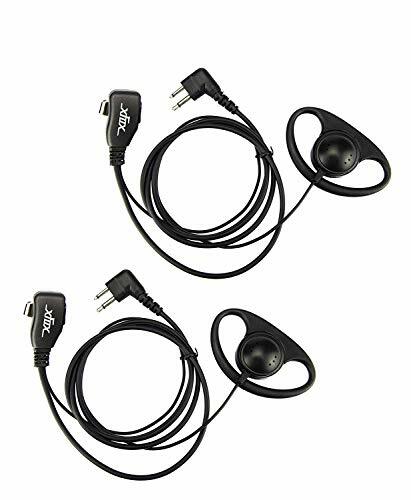 Compatible with motorola two way radios walkie talkie that required 2 pin plug. Including CLS Series, XTN Series, P100 Series, CP Series, DTR Series, P Series, PRO Series, XTN XU Series, XTN AX Series, Spirit Series, Spirit MU Series, Spirit MV Series, GP Series, SP Series, CT Series, RDX Series and Other Series: ECP100, EP450, AP10, AP50, AP73,PMR446, MagOne BPR40, AU1200, AV1200. If you have any questions about this product by XFOX, contact us by completing and submitting the form below. If you are looking for a specif part number, please include it with your message.